The price of automobiles is forever going up, but the 5.2% increase we've seen year-over-year after strong sales can at least partially be tied to the fact that people are buying more expensive trucks and SUVs. According to KBB, via Auto News, the average transaction price was $33,993. Grey skies are gonna clear up, put on a happy face (and hope gas prices stay low for a little longer)! A strong fourth quarter means that GM took home $2.8 billion in 2014, even with all the restructuring and recall costs. This also means that eligible GM hourly employees will get up to $9,000 profit sharing checks. According to The Detroit News, GM also wants to reward investors by upping their dividend to $0.36 a share, but that still needs approval from the board. 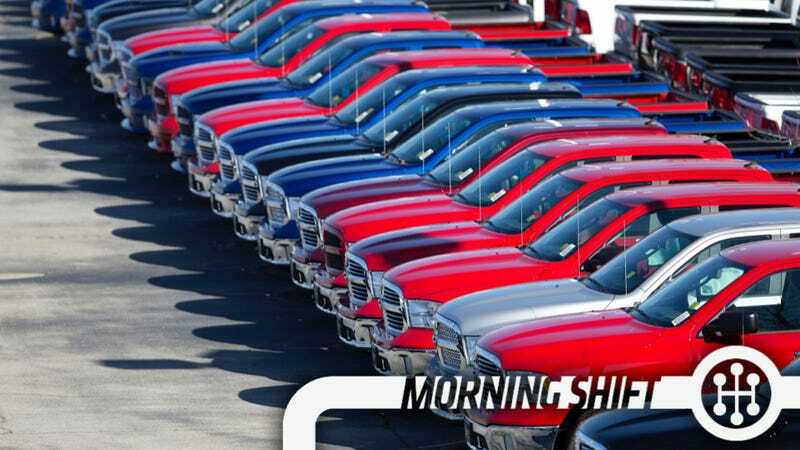 Like everyone else, GM is having to figure out what they're going to do with Russia. Interesting talk from Ford CEO and awkward handshaker Mark Fields earlier today in Germany, who warned about the encroachment of other companies into his space. "There are others who we never thought five years ago would be competitors for us," Fields said on Wednesday, stopping short of naming which companies were emerging as sector rivals. Software maker Google recently unveiled an autonomous vehicle. "Guess what, they are looking at our industry, not taking anything for granted, they are questioning tradition and they are knocking down walls. I want to make sure Ford doesn't end up like the handset business," Fields told an automotive conference in Bochum. He added that most mobile phone makers had become reliant on the business model of telecom providers. Driverless cars. Car sharing. It's a different world. One of these days I'm going to drive a Quadski. It's just so perfectly ridiculous. I think I'm going to wait for the recall to be over because, according to the Freep, the Quadski is part of a recall. The problem with the Quadskis, according to the commission, is that "the handlebar can fail while the vehicle is in operation, causing the operator to lose control of the steering and braking system of the vehicle, posing a risk of injury." No consumer incidents have been reported. I could see that being an issue. 5th Gear: A Corporate Tax To Pay For Roads? Something is going to have to give or we're not going to have well-maintained roads anymore. It's as simple as that. Because a Gas Tax is DOA and does have some negative consequences, President Obama's latest pitch is to tax about $2 trillion in offshore profits from companies based in the United States. On February 4, 1922, the Ford Motor Company acquires the failing luxury automaker Lincoln Motor Company for $8 million. Neutral: How Much Did You Pay For Your Last New Car? When was it?